Home to a wide-variety of reasonably-priced, comfortable lodging, from campgrounds and cabins to family-run motels and resorts with spas, the communities of Mammoth Lakes, June Lake, Lee Vining, Bridgeport, and Walker-Coleville all have extensive offerings for Eastern Sierra visitors. With hundreds of miles of hiking trails, countless lakes and streams to fish, and must-see stops like Bodie Ghost Town, Mono Lake, Devils Postpile and Rainbow Falls – visitors are well advised to spend as many nights as possible on the east side of the Sierra. Want to ski before hitting the trail or head out fishing? Mammoth Mountain Ski Area, boasting the longest ski season in North America, will be open into June this year. Savvy travelers can also take advantage of the amenities and convenience of staying in Mono County and traveling into Yosemite for day-trips (the National Park’s accommodations and campgrounds tend to fill up fast). Even better, starting in June, the Yosemite Area Regional Transit System (YARTS) will do the driving for visitors. With scheduled stops in Mammoth Lakes, June Lake and Lee Vining, passengers enjoy the majestic views on the way to Tuolumne Meadows and Yosemite Valley without worrying about traffic or parking challenges in popular Yosemite Valley. Service is round-trip, includes the park entrance fee, and kids 12 and under ride for free with a paid adult ticket. Daily service runs from July 1 through Aug. 31, three times a day with two shuttles heading to Tuolumne Meadows and one shuttle continuing on all the way to Yosemite Valley. Weekend-only service to Yosemite Valley is offered in June and September. A complete schedule can be found online at www.YARTS.com or by calling 877-989-2787. Spread the word that the mountain passes are open and start planning a road trip adventure with friends and family to the Eastern Sierra. To request a visitor guide, visit MonoCounty.org or call 800-845-7922. About Mono County: Located approximately 315 miles north of Los Angeles, and 280 miles east of San Francisco, Mono County accesses the east entrance to Yosemite National Park and beckons visitors in all seasons. Whether taking advantage of convenient direct flights on Alaska or United Airlines from Los Angeles International Airport (LAX) to Mammoth Yosemite Airport (MMH) or arriving by car on the all-weather US Highway 395, the Eastern Sierra’s vast playground is an easily reached destination. US Highway 395, which traverses Mono County from north to south, is a state-designated Scenic Byway offering motorists tremendous vistas right from the steering wheel and countless side-roads, hiking trails, lakes, and roadside villages to explore. From Bridgeport to Crowley Lake to the John Muir Wilderness, with stops at Bodie State Historic Park, a tour of Mono Lake and a swing through quaint June Lake—many unique gems add up to a guaranteed memorable vacation getaway. 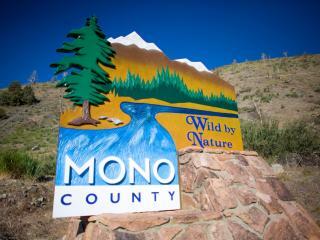 For more information or to request guides, visit MonoCounty.org or call 800-845-7922.